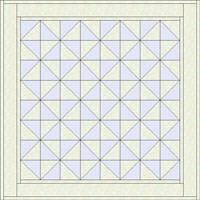 Broken Dishes is a simple pattern consisting of triangles arranged in a four-patch square. 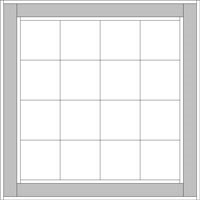 The squares are turned at different angles to create the broken dishes effect. 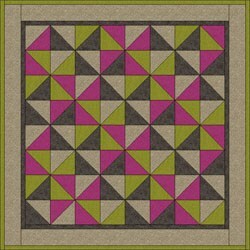 It is a popular pattern with examples dating back to the 1790s and is one of the most common, earliest recorded designs in quilt history. 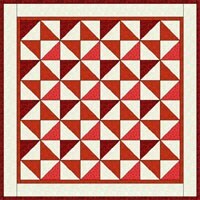 Though a charming name that could have been inspired by many things including household accidents or even shattered dishes along the rough and rugged trail West, like many quilt patterns, it cannot be traced directly to any one original source. Most pattern histories come to us through folklore, old magazine articles, and sometimes diary or journal entries. It is a wonderful pattern to utilize colorful scraps of leftover fabric, but can also be quite striking and modern-looking if made using only two colors. 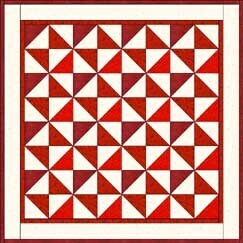 Other names for this pattern are Old Tippecanoe, Bow Ties, Hour Glass, Whirling Blade, and Yankee Puzzle. Start a new project and name it Benni-Dishes. Click LIBRARIES > Block Library > Click on the Search button > by Notecard (make sure the first checkbox is checked) > Type “Broken Dishes”. Click Search. Find Broken Dishes (the first block) and click Add to Sketchbook. Click Close to put the library away. 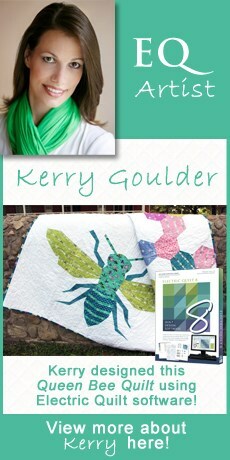 At the top of your screen, click WORKTABLE > Work on Quilt. At the bottom of your screen, click the Layout tab. Be sure there is a check next to All and also Clone the selected border. Click the Add button twice. You should have 3 – 1″ Long Vertical borders now. 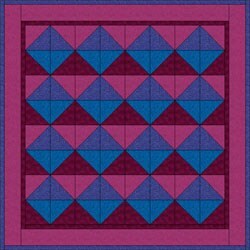 Your quilt center and borders are set up, so click the Layer 1 tab. Click on the Broken Dishes block in the palette to select it. Click the Swap All Colors tool. Find a light muslin or white fabric in the palette and click on it to select it. Position your cursor over the red in the blocks and click. The red will be replaced with the muslin. Click on the middle border with the Swap tool and the same muslin/white. All three borders will change at the same time, but don’t worry. They did this because they all had the same color. We’ll color the inner- and outermost borders after a few other steps. Find a very dark red in the palette and click on it to select it. Hold down your keyboard CTRL key and click on the triangle in the upper-left corner of a block. All the blocks will change at the same time because you are using the CTRL key. 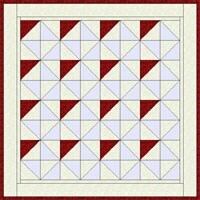 CTRL + click this same fabric with the Paintbrush tool into the outermost border. Find a light red in the palette and click on it to select it. Hold down your keyboard CTRL key and click on the triangle in the botom-right corner of a block. All the blocks will change at the same time because you are using the CTRL key. Find a medium red in the palette and click on it to select it. Hold down your keyboard CTRL key and click on the two white triangles in the center of a block which form a bow-tie. 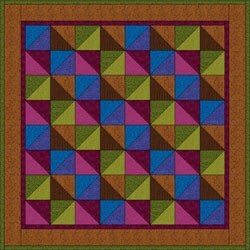 CTRL + click this same fabric with the Paintbrush tool into the innermost border. Your blocks and borders are colored. Good job! In the top Name field, type: “My Broken Dishes quilt”. Your Broken Dishes project is now complete, and saved on the hard drive. This lesson shows you the difference between using the Swap All Colors tool and the Paintbrush tool + CTRL. 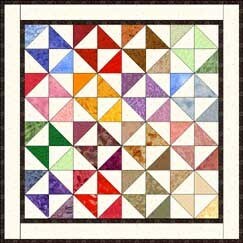 Swap All Colors tool = colors all patches of one color to the new color all over the whole quilt. 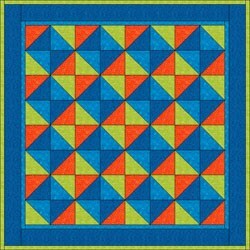 Paintbrush tool + CTRL = colors the same patch in all matching blocks, no matter what the original color. Make sure you learn the difference by spending some time experimenting with both tools, just playing. To undo, use EDIT > Undo. Here’s what another variation could look like if you used the Spraycan tool (without the CTRL key) and just chose light, medium, and dark values of different fabrics.